Cameco’s Yeerrilie uranium mine proposal knocked back in WA Goldfields http://www.abc.net.au/news/2016-08-03/uranium-mine-proposal-knocked-back-in-wa/7685538 Western Australia’s environmental watchdog has knocked back a proposed uranium mine in the state’s Goldfields, at the site of Australia’s largest uranium deposit.The Environmental Protection Agency said Cameco Australia’s Yeelirrie Uranium project could not meet one of the nine key environmental factors. The Canadian company sought to mine up to 7,500 tonnes of uranium oxide concentrate per year from the Yeelirrie deposit, about 420 kilometres north of Kalgoorlie-Boulder and 70km south-west of Wiluna. The facility was to include two open pits, processing facilities, roads, accommodation, stockpile and laydown areas. It would have transported the uranium oxide by road for export through the Port of Adelaide. The authority’s chairman, Dr Tom Hatton, said the assessment process was extensive and involved public consultation and a site visit. He said the proposal would threaten more than 70 species of underground fauna, known as “stygofauna”. The proposal had attracted protests, including from traditional owner Kado Muir, who argued there was no broad community support for uranium mining in Western Australia. The EPA put the proposal up for public comment for 12 weeks, attracting 169 responses and a further 2,946 pro forma submissions. The EPA gave a proposal for Western Australia’s first uranium mine the green light in 2012, the first to be approved since the lifting of a state ban on uranium mining in 2008. But the project, put forward by South Australian mining company Toro Energy, has stalled on the back of falling demand and global prices for the commodity. The Conservation Council of WA and the Australian Conservation Foundation have welcomed the WA EPA’s recommendation not to approve the proposed Yeelirrie uranium mine. The decision was based on the unacceptable risks the plan posed to subterranean fauna and also addresses wider environmental and community concerns. “This is an important decision that prioritises the survival of a number of different species and the health and wellbeing of the local community,” said CCWA nuclear free campaigner Mia Pepper. “CCWA’s submission to the EPA identified the likely extinction of several species of underground fauna, known as stygofauna and troglofauna if the proposal were approved and it is pleasing to see the EPA has considered that evidence. “The EPA recommendation has been met with great relief among pastoralists, Aboriginal communities and environment groups who continue to campaign against uranium mining in WA. “The former proponent of the Yeelirrie uranium mine, BHP Billiton, conducted extensive and systematic surveys of subterranean fauna. National environment groups have joined their state counterparts in welcoming the EPA’s call.“We congratulate the EPA for making this important, clear and strongly evidence based recommendation,” said the Australian Conservation Foundation’s Dave Sweeney. https://www.facebook.com/groups/941313402573199/ This secrecy is outrageous. It would not happen in America. The whole bs about “medical wastes” is one big cover-up for the transport of a tiny amount of intermediate to high level nuclear wastes returning from France. The plan is to continue to take in such returning nuclear wastes, so that Lucas Hieights’ reactor can continue to produce them. After that, how convenient for the global nuclear lobby, if South Australia is already taking in ‘Australian’ high level wastes. 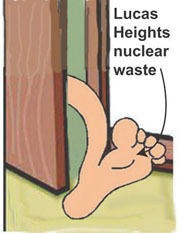 What a lovely precedent for the global nuclear waste import plan. Gavin Smith The Intermediate Nuclear Waste from France is really High Level Waste bound for the Flinders Ranges to be stored indefinitely in a shed during Earthquakes, the 50 degree C heat of Summer and the Outback Floods of Wonoka Creek . Gavin Smith We are expected to turn up to Hawker for 2 hours today and submit Environmental and Health submissions to the Government reps. about the Nuke Dump No Public notice for submission from the General Public have been called for as this is a Local Hawker matter. Local seems to be the key words used by the people in the dump area who believe it is a benign development and make a point that outsiders educated opinions are unwelcome . Australia’s Secret Shipment of Radioactive Nuclear Waste Arrives ! Bronwyn Lucas Today already! There’s a tourism operator forum on at Beltana Station, so I’d imagine that there’d be a few locals at Beltana, not able to attend. We can’t make it today either. This will be the tick the box and no-one is concerned b.s. Gavin Smith Bronwyn Lucas Part of the plan . Station Stays people will be at that venue. Check the Get About in Hawker Page for the notice. The Fed Gov. web page has no public consultation listing and no advice or invitation for written submissions from the public . Jut the 2 hours of over the counter at Hawker . The Local Council must surely be aware of what is going on and no advice is coming from there either . Gavin Smith It is a site that locals use . People are not game to voice any opinion against that of businesses and councils in small places . I do and pay the price for it . Bronwyn Lucas I’m very sorry to hear that you may be being ostrasized, Gavin. At least the Quorn Caravan Park, Flinders Rangesand Quorn Cafe are questioning at least the process of getting the repository into the Flinders Ranges, so you’ll find at least a couple of friendly businesses this way and lots of friendly locals, also asking more questions and needing more answers. Gavin Smith Bronwyn Lucas The fight for what is right is not on if you only engage with like minded I suppose. The Murraylands has been a battlefield for the environment for me over many years . Joy Engelman The process is deliberately designed to bypass people. I am not sure what can be done except to say people need to be ready and vigilant. The govt usually putsa small ad in the back section of local papers in the public notices and usually onle one ad on a day when the paper isn’t popular like a Tuesday. That way they can claim it was advertised but no-one was interested. Gavin Smith Joy Engelman I checked the website. Has anyone seen anything at Quorn or Port Augusta about it. The FRC have only posted council meeting stuff on the 20th July and 7 days is a joke for submissions to been delivered in person. Ch 7 Today Tonight is close to getting a call on this one. Mike Smithson loves a cover up story . Gavin Smith Joy Engelman It is a national project and we should all be given a fair go . It is not in the Council Region but Outback Lands . My blood is near boiling point about this. Joy Engelman Gavin Smith l have written to a couple of ministers, made a submission to the Royal Commission, yourSay and also emailed the Dept of Conservation This has helped me get rid of some if my frustration and hurt about this. I encourage you to do the same. Write and complain, ask questions of govt. It does help. My heart goes out to you all… To all of us! Outgoing senator Edwards lost his seat after winning the fifth spot on the Liberal ticket. Senator Edwards said it had been an honour to serve in the Senate. The concerns that this approach is focussed more on manufacturing social license or acceptance of the dump plan, rather than forensically and objectively analysing the full range of risks and opportunities, have increased following news that a key adviser to the nuclear Royal Commission was an industry “true believer” linked to a failed attempt to open a global radioactive waste dump in Australia in the 1990s. In the late 1990s, public outrage forced Pangea to abandon its dumping plan. Today, a pro-nuclear Royal Commission is using public funds to facilitate Pangea’s inheritors to rewrite the proposal. 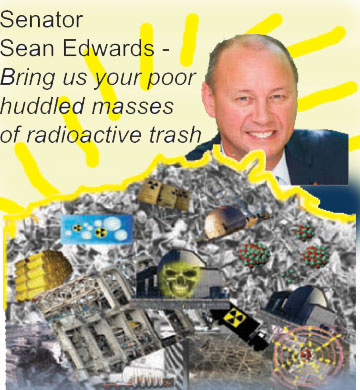 Big bucks, radioactive waste and a biased SA Royal Commission https://independentaustralia.net/environment/environment-display/big-bucks-radioactive-waste-and-a-biased-sa-royal-commission,9304 1 August 2016 Following SA’s nuclear fuel cycle Royal Commission, a publicly-funded PR campaign is attempting to make the largest ever radioactive waste dump in the world, a tepid topic, writes Dave Sweeney. A STATE-BASED Royal Commission unleashed a plan with massive national implications when it recommended, in May, that South Australia should move to import, store and bury around a third of the globe’s high level radioactive waste ‘as soon as possible’. The Royal Commission, initiated by PremierJay Weatherill in 2015 and presided over by former governor and self-proclaimed state salesman Kevin Scarce, has unsurprisingly generated column inches, congratulations and critics. One of their [climate denialists] cheerleaders is Frydenberg’s successor in the resources portfolio, Queensland senator Matt Canavan. Canavan has form as a climate science doubter. A fortnight ago he told Sky News that the impact of carbon emissions had been “overhyped” by “certain interest groups” — in line with an earlier newspaper article in which he advocated funding “scientists who take a different view”. August 2, 2016 “……..Malcolm Turnbull’s Cabinet reshuffle saw climate and energy combined for the first time in the one portfolio, which I think was a good decision. Putting coal-power champion Josh Frydenberg in the job may not be, but in this new regime I am prepared to keep an open mind.If he is to understand the perils of burning coal, Frydenberg first has to come to grips with the science of climate change. His performance on ABC’s Lateline last week shows he has work to do. “I absolutely accept that man is contributing to climate change,” he declared. But that is not really how it is. Saying we are contributing to climate change is like saying the sun contributes to a warm day, or Hawthorn contributed to winning last year’s AFL premiership. In the cautious words of the Intergovernmental Panel on Climate Change, there’s a 95 to 100 per cent chance that human activities have been the dominant cause of observed warming since the mid-20th century. We have not just contributed to climate change — we have caused it. In the same Lateline interview, Frydenberg said Australia’s 2030 target — emissions 26 to 28 per cent lower than in 2005 — was “very ambitious” and among the highest in the world on a per-capita basis. We have already heard the same from Abbott, Hunt and Turnbull. All have failed to acknowledge our unhappy record of long being the G20’s highest per-capita emitter, skated over much tougher European targets, and ignored completely the all-important target of zero emissions. Frydenberg is taking the classic conservative halfway position, allowing the established scientific truth that human emissions affect the climate but dodging the further truth, reinforced by every IPCC report, that their impact is both potent and increasingly dangerous. What next for Britain’s beleaguered Hinkley nuclear power plan? The nuclear option: Where next for Hinkley Point?, business Green, Madeleine Cuff, 2 Aug 16, Last week was quite a rollercoaster for those involved in low carbon energy policy. French utility EDF spent the first part of the week drumming up media excitement for a final investment decision on its Hinkley Point C development, briefing heavily that the project would likely be green lit by the board on Thursday – a decision widely viewed as the final hurdle for the UK’s first new nuclear power plant in a generation. Tom Burke, chairman of E3G……..really, the government should drop the project. It’s now taken most of the political damage for abandoning it anyway. All of the people opposed to it – financial analysts, credit rating agencies, environmentalists, even members of the EDF board – have been encouraged to redouble their efforts to stop what is now I think pretty widely recognised by everybody outside of government and nuclear theologians as a very bad deal indeed. You now have huge momentum behind the calls for the government to enact a Plan B.
Indigenous leaders at the Garma festival in northeast Arnhem Land have called for land ownership settlement, slamming the ‘failures’ of the Land Rights Act and Native Title Act that have allowed mining companies access to indigenous land. Federal environment department says Unesco sought and was granted heavy redactions in freedom of information documents, Guardian, Michael Slezak , 2 Aug 16 The United Nations has tried to cover up its involvement in the Australian government’s successful attempt to have all mentions of the country removed from a report on climate change and world heritage sites, freedom of information documents show. In May, Unesco published a report with the UN’s environment program, Unep, and the Union of Concerned Scientists about the impact of climate change on world heritage sites, which were also major tourist attractions. Could big data soon make renewable energy storage free?, Independent Australia 2 August 2016, A new report explores the democratising of renewable energies through the advancement of “big data”.RenewEconomy‘s Giles Parkinson reports. Citi is not the only research institution making such forecasts but it is in sharp contrast to the general public discussion in Australia, which is dominated by those who insist that the old centralised energy system – slow, inefficient and expensive – will not and cannot be replaced by new technologies. South Australia is now the focus of that debate, and the push-back against wind and solar by conservatives and, of course, vested interests, seeking to protect their sunk assets is striking. Does not compute: Australia is still miles behind in recycling electronic products, The Conversation Graciela Metternicht This article was co-written by Ashleigh Morris, an honours student in environmental management at UNSW Australia. August 3, 2016 Australia is lagging far behind other rich countries in dealing with the growing mountain of “e-waste” from discarded electrical and electronic products.